Space: Trash in the heavens, but how to cart it off? 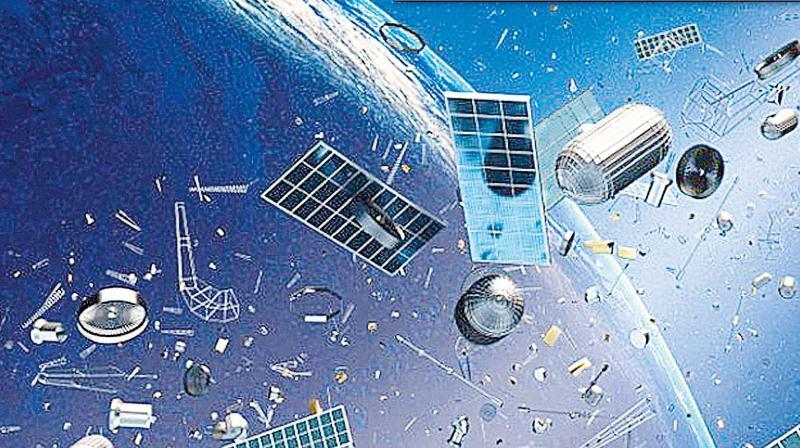 Isro’s Radar to track the trajectory of space junk is part of an international effort to mitigate a global problem. In the post-Cold War era, these radars are sharing data on space debris with all space-faring nations.Perhaps, all these radars could help track and cart away the trash by 2050! It’s the David versus Goliath narrative in outer space, albeit with a twist in the tale, as Goliaths duck Davids, because even a fleck of paint packs the same lethal punch as a 550-pound object travelling at almost 120 km per hour. Space scientists have been moving satellites, including the International Space Station (ISS) a couple of km every time they spot junk (fragments of defunct satellites, rocket parts or remains of an anti-satellite weapon test carried out by China in 2007, solar cells or components the size of a salt-sized grain), hurtling at seven km a second, as a collision could damage critical components, incapacitate spacecraft or produce more fragments. A rough estimate of such debris: 5,500 tonnes of over 170 million pieces, some smaller than one centimetre. Indian space scientists have joined other space-faring nations to work on space debris mitigation techniques. “Everybody wants to clear outer space of debris, but how to do it is a billion-dollar question. We are part of the Inter-Agency Space Debris Coordination Committee (IADC), an international governmental forum that coordinates global efforts to reduce debris by sharing research and identifying debris mitigation options,” says Dr K. Sivan, director, Vikram Sarabhai Space Centre (VSSC), Thiruvanan-thapuram. The options, he says, include preventing the creation of new debris, designing satellites to withstand impact by small pieces, improving operational procedures such as using orbits with less debris, and so on. “Earlier, we used to allow the last stage of our PSLV rocket along with some fuel to drift away after launching the satellite, but now we make sure that the fuel is exhausted in order to prevent an explosion of the last stage, which would result in addition of more debris. It is better to be safe, and avoid the addition of more junk,” Dr Sivan explains. Isro has commissioned a Multi-Object Tracking Radar at Sriharikota, the country’s space port, to track the trajectory of 10 pieces of space junk and share the data with IADC. It’s a small step in addressing a mammoth problem, but it is part of the international effort to mitigate this global problem. Experts are also being supported to pursue studies on how to flush out the debris. Bits and pieces of space trash measuring four inches or more are being tracked by the US and Russia since the days of the Cold War. The US set up the North American Aerospace Defence Command, with its headquarters at Peterson Air Force Base near Colorado Springs, Colorado, along with Canada. Ditto with Russia and its string of radars scanning the skies for missiles. In the post-Cold War era, these radars are sharing data on space debris with all space-faring nations.Perhaps, all these radars could help track and cart away the trash by 2050! Outer space is littered with pieces of junk the size of a football, marble or even flakes of paint. Indian space scientists have joined their peers across the world to flush out these bits and pieces that could prove harmful to orbiting satellites. The US Vanguard 1 satellite, launched in 1958, is the oldest artificial satellite still circling the Earth, despite its low orbit. The number of satellites launched since Sputnik in 1957 has spiralled to 1470. In 2009, a defunct Russian military satellite struck an operational American Iridium satellite over northern Siberia, blowing even more trash into space. Nasa was the first space agency to issue guidelines for orbital debris mitigation in 1995.